What is a mutiplayer game without teamwork mechanics? That's partially what was on my mind between the last update and this one. Sure, the game felt fun enough. You get to shoot at stuff no matter which side you're on, and explosions are objectively fun. Nonetheless, the Dragonfly side felt lacking. In a 4v1, it felt like there wasn't quite enough teamwork. Everyone was shooting at the same target, yes, but there weren't any opportunities to work "together". All weapons were purely for attacking, nothing really meant for tactical gameplay. So I scrapped some mechanics and added new ones. Mechanics focused on creating a little more dynamic teamplay. Is it perfect? Probably not, but it's a start. Here are some of the things that have been changed. For the primary offensive abilities, Big and Seeking were removed. There just wasn't enough difference between them and rapidfire and shotgun to warrant keeping them in. Rapidfire is kept in as what feels like the most "default" of the weapons, while allowing the player to keep constant and well-aimed pressure on the Goliath. Shotgun is nice for creating chaos and filling a space with bullets. The Big Shield is a hemisphere released in front of the ship that moves forward slowly and hangs around for a while or until destroyed. 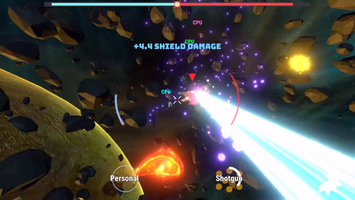 While the personal shield only protects you, the Big Shield stops the Goliath's beam in its tracks and protects anyone behind it from shockwaves as well. The secondary ability for this is a pistol; not very special, but relatively accurate, and can certainly deal out some damage if you're sitting pretty behind a shield. While you aim at the Goliath, Hack will take a few seconds hacking, and then disable the Goliath's shields. The shields will remain down and won't recharge while the hack is maintained, giving the rest of the team a good opportunity to attack. However, while hacking, a beam of electricity will be shown from the Dragonfly to the Goliath, making the Dragonfly an easy target to spot. Hacking also puts a shield in front of the hacker, making it take a little longer for the Goliath to get through to them. Everyone wanted to ram into the Goliath. And I mean everyone. The Ram ability is the answer to that call, allowing the Dragonfly to blast off toward their target after a short charge-up. The Dragonfly is invincible while ramming, and a successful hit will not only damage the Goliath, but also slow down their movement for a brief period of time. In addition to changing a lot of mechanics, there are now voices in-game! The Goliath is voiced as a maniacal AI hell-bent on destroying the human race, while the Dragonflies are human-piloted ships. There's a bit of menu music and results music now too. Small pieces, but they help contribute to a feeling of a full and complete gameplay loop. 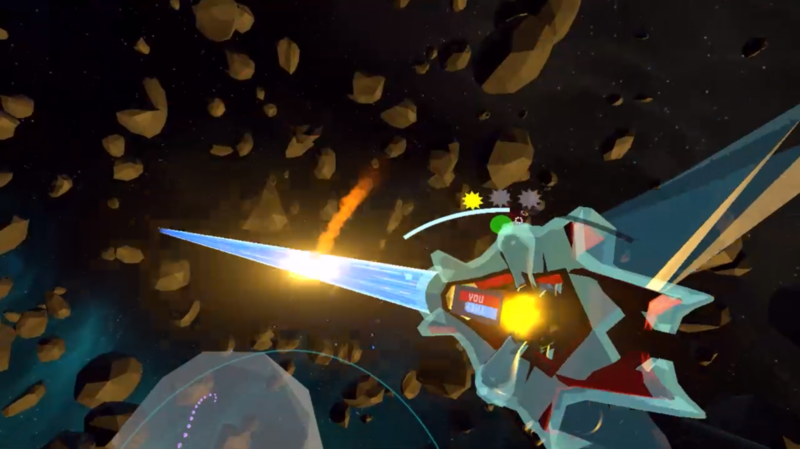 Lastly, I was tired of needing to make a new game build every time an easy change (ship speed, fire rate, etc.) needed to be made, so I decided to create an in-game settings system so many values like that could be changed in real-time, even in the middle of a match. (This can be accessed by pressing ESC or the menu button on the Vive controller.) Not only does this make testing easier, but it allows for very customizable game modes you can save and load. Is the Goliath too overpowered? Move their shield energy down a few notches. Alternatively, give the Dragonflies more power or a faster reload time. Even if it doesn't feel unbalanced, it's always fun to make every player 10x as fast and see what happens. Don't let your schemes be dreams. Use the settings panel. A "Demo Mode" option is available in the settings panel, which allows you to start a game against CPU and have real people jump into the game in their place by pressing start on a controller. Also the other way around. This is going to be used in conventions, so people can come and go as they please without greatly affecting gameplay. A little intro cutscene. It's rough. It's unpolished. It needs some work. But it's there. Go. Play. Be merry. And all that jazz.